A research team from ITMO University and the University of Rochester (U.S.) conducted a study on the formation of terahertz radiation in liquids. Previously, the generation of such radiation in a liquid medium was considered impossible due to high absorption. However, in their new research, the scientists described this phenomenon's physical nature and demonstrated that liquid radiation sources can be equally effective to traditional ones. The results have been published in Applied Physics Letters. Terahertz electromagnetic radiation can easily pass through most materials except metals and water. Today, it is widely used in security systems used to detect illicit drugs and weapons, as well as for biomedical research. Most modern research involving terahertz radiation focuses on finding new, more stable, powerful and efficient sources. The most common sources of terahertz radiation are solid materials. In addition, there are sources based on femtosecond laser filamentation in air and gases. 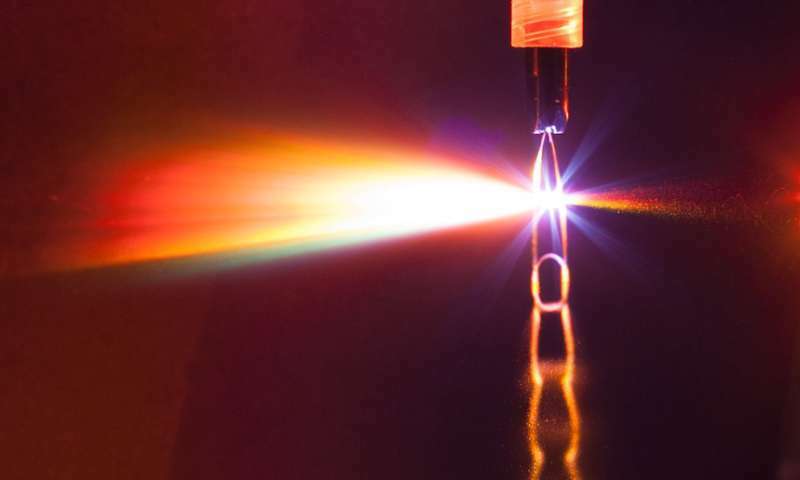 In this case, a powerful laser beam creates a plasma in the gas medium by ionizing it so that free electrons generate electromagnetic terahertz radiation. Although doing the same in a liquid medium was until now considered impossible due to high absorption, an international research team from ITMO University and the University of Rochester showed the opposite. Their new study revealed that liquid, in fact, has a number of advantages over other sources such as gases. "Until our colleague, Prof. Xi-Cheng Zhang, had been able to detect terahertz radiation in a liquid, it was believed to be impossible. But we demonstrated that, in terms of efficiency, liquid sources can approach solid-state sources, which are now considered to be the standard. Moreover, liquids are much easier to obtain than crystals. They can also withstand high pumping energy, which makes it possible to obtain a better output," explains Anton Tsypkin, Head of the Laboratory of Femtosecond Optics and Femtotechnology at ITMO University. Usually, radiation is generated due to the release of free excited electrons during filamentation. The more electrons can be excited or ionized, the stronger the output terahertz radiation will be. The number of excited electrons of one molecule depends on the energy spent on the excitation or "pumping" of the medium. The difference between the required "pumping" energies in gas and liquid is small. At the same time, the density of molecules in a liquid is much higher than in a gas, so that a comparable pump energy makes it possible to excite more electrons and make the radiation stronger. Scientists investigated the direction of terahertz radiation in the liquid. Experiments were conducted in parallel at two universities so as to eliminate errors. Then, the scientists verified the independently obtained results and worked together on a theoretical model to explain them. As a result, they managed to draw up and physically substantiate the radiation patterns of terahertz radiation in a liquid and its dependence on the angle at which the liquid collides with the pump radiation. According to the researchers, these results will be used in future work. "A significant drawback of fluid is its large absorption. We plan to solve this problem by optimizing the type of fluid, the shape of the jet, the pump power and a number of other parameters. We want to experimentally find the optimal parameters for the radiation generation in different liquids, as well as to develop a theoretical model based on this data. It can be used to create a prototype device that will allow us to produce different types of terahertz radiation from liquids," says Xi-Cheng Zhang, co-director of the International Institute Photonics and Optical Informatics at ITMO University, and a researcher at the University of Rochester.